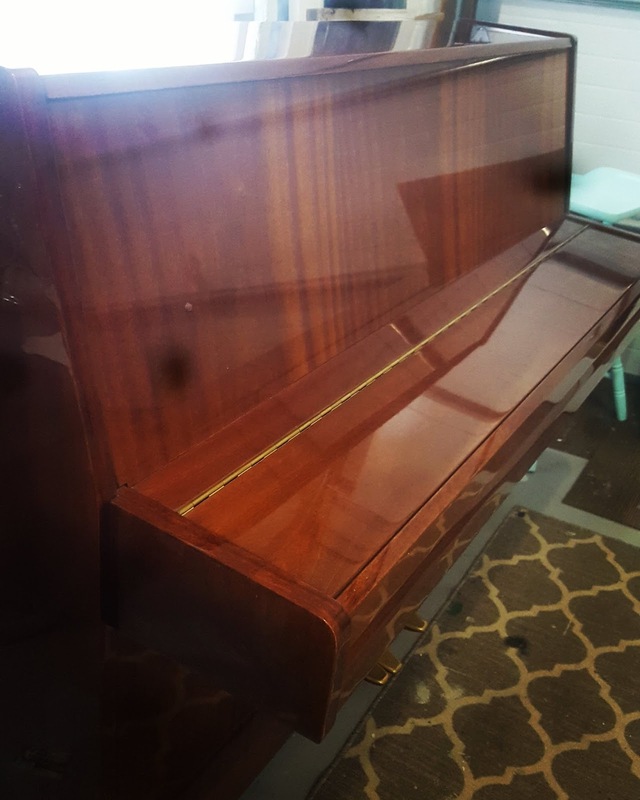 I had a client who inherited her grandfathers piano. Her and her husband dislike the dated orange, yellow, brown and super shiny look and felt as if it was an 'eye sore' in their main living space. She asked me if i could transform it for her, YES YES YES!! 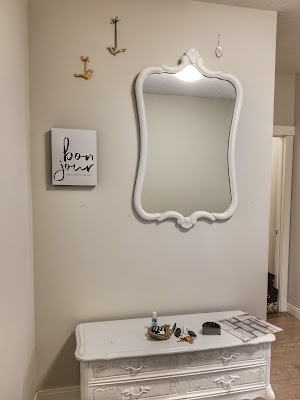 I totally get the feeling of the history and family ties with this piece yet wanting an updated look for your 2018 home. I specialize in mixing eras! 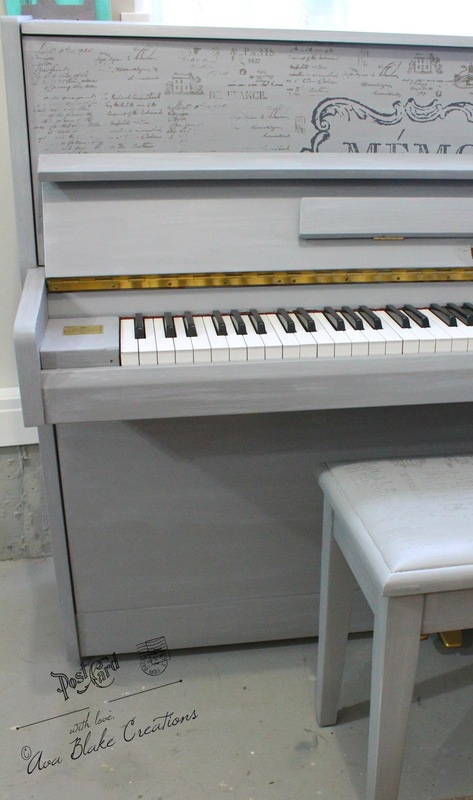 Here is where the challenge lies...the piano is SUPER shiny and feels almost like plastic but is in fact solid wood, and there is absolutely NO detail on it whatsoever! Good thing I love a good challenge! Firstly, when the piano top is opened it smells like a sophisticated bourbon, a sweet faint cherry cigar, and slightly like a clean, older, Vegas casino. Trust me, it was a nostalgic but glamorous evoking smell and I liked it! OH, the history! Here is a product picture of what I used for this project, going clockwise... Iron Orchid designs Furniture Transfer, Iron Orchid Design "letters" stamp, Iron Orchid Decor Ink, Fusion Mineral Paint Brush, Ultra Grip and Little Lamb Grey Paint. I prepped the piano with a Fusion Mineral Paint Product called Ultra Grip that is specifically made for adhesion. 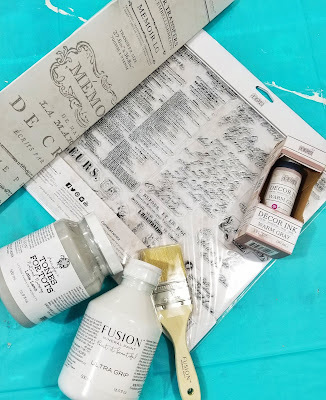 I then painted it in the Fusion Mineral Paint Little Lamb from their Tones For Tots Line. Little Lamb is a soft medium grey. I wanted to add some depth to the piano so I gave it a light wash over with a Glaze in Crisp White. 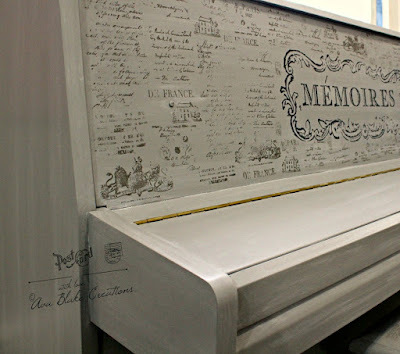 I then cut up a piece of the 'Memoirs Large' furniture sized rub on transfer from Iron Orchid Design and used a piece for the front face of the piano. Cute...but it needed more! 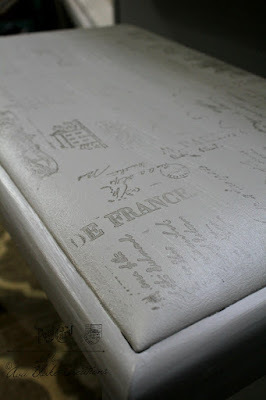 I grabbed our IOD furniture sized stamps in the "letters" design, which is a bunch of different hand written mini letters in different fonts and I stamped the entire front face around all around the Memoirs transfer. This piano could totally handle it. Here is the finished picture. The entire piece, although hard to see the glaze and depth in this picture have such an airy elegant feel to it now. This picture was taken with the piano in my studio, not back in the clients home. Here is a close up of the gorgeous stamp and face of the piano. Here is the stool that matches the piano. I feel like it added a perfect balance to the piece. 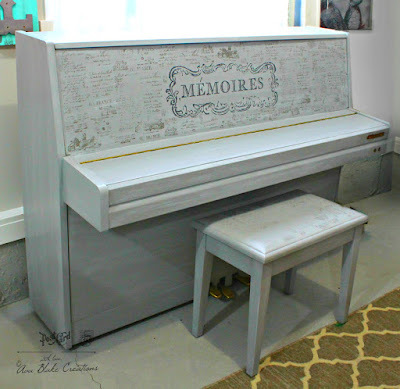 My client was super happy with her piano transformation, and that makes me happy!